With complimentary Wi-Fi and an indoor pool it's no wonder the Best Western Plus Danville Inn is a popular choice among our guests. The Best Western Plus hosts 58 rooms all equipped with free Wi-Fi irons and ironing boards sofa beds premium cable TV (HBO included) DVD players work desks coffeemakers and voicemail phones. Complimentary newspapers and coffee are available in the lobby. Recreation is easy here: there's a heated indoor pool and a fitness center on the premises. As for work-related amenities you'll find a business center on-site plus fax service photocopiers and meeting rooms. Parking is free. 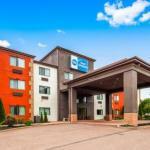 The Best Western Plus is off I-80 three miles from Geisinger Medical Center and the Iron Heritage Festival. It's 10 miles from the Bloomsburg Fairgrounds and 12 miles from Knoebels Amusement Park and Bloomsburg University. Harrisburg International Airport is 80 miles away.